Prachi was born to a noble family in Kuong Kingdom jungles in fabled Malatra. A birth like many others, but strange things kept happening when the house astrologer tried to draw the girl's horoscope in a due time to determine her Path and Future. Fearing that Prachi is a Star-lost, the astrologer advised the parents to bring the girl to the Temple City of Ratneshwar. The wise priests there would be able to determine the appropriate Path of Duty for the girl. Upon years of study, the sages declared that Prachi should undertake a perilous pilgrimage and she embarked on a long journey starting in the port city of Marabaya . Her road eventually led her to the Spine of the World, where her teachers say was one of the world's beginnings. 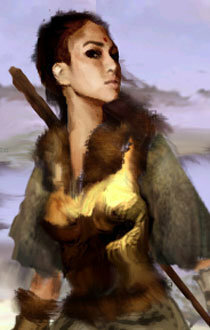 * As a Monk Prachi also gets the usual Monk's perks: Deflect Arrows, Improved Evasion etc. Prachi is a conflicted person who overrides that conflict by sheer force of will, meditating and iron discipline. While she does not have stability of character and intelligence to understand the teachings she was exposed to, she does her best to stick to them, more so because she is all alone in the West. Because of the uncertainty coming from so many souls waking up in her subconscious she may well appear easy to sway, but this is a false impression. She tries to establish a peaceful relationship with other NPCs. If you are looking for a calmer NPC, Prachi is a good choice, but if you are easily irritated by the talks about reincarnations and inner peace, you might want to avoid her.